in the 9th Student Blogging Challenge. Please check very carefully the student or class participation pages to make sure you are listed. I have had to remove some students and classes as their URL addresses didn’t work when I tried to leave a comment. You might need to register again. But PLEASE check carefully before doing this. If you haven’t received a comment from me, please check your spam as I did have two links in the comment and this is often added as spam. Also some students didn’t receive a comment because they did not have a page or post written when I visited or else I was asked to log in to leave a comment. To check if someone can leave a comment on your blog – don’t log in to your blog, just go to the blog and try to leave a comment. If you can’t leave a comment or even read the post, then you will need to change your settings. Activities will be separated into two sections: Firstly those related to improving your blog for your new readers and secondly ideas for posts on your blog. You can do one activity or lots of activities. What you don’t finish this week, you might want to do next week. Whenever you visit a new blog, you want to know a little about the author or group of authors. This fits very well into our first group of activities. 1. Create or update a page about yourself or your class. 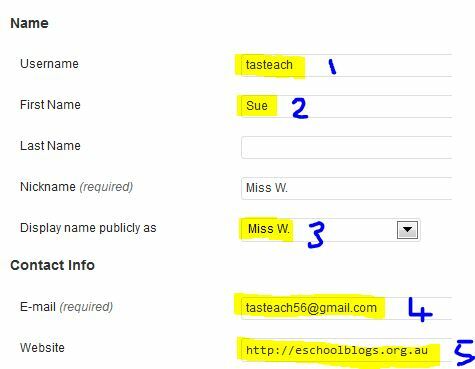 If using Edublogs, you have a page called Sample Page when you first get your blog. You could use this page by deleting what is already in there, editing the permalink to About Me, and writing about yourself or your class. Remember not to include personal information (part of digital citizenship) but really tell us about yourself. You might want to check out some examples from other students and classes. Login to your blog, go to the dashboard>pages>all pages> hover under sample or about page and click edit. Justin suggested: I think a great activity would be to create a Prezi which showcases facts and pictures about your school. Perhaps even upload a video and link it to the Prezi too. 2. 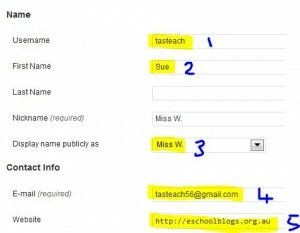 Make sure you have filled in your blog profile page correctly. You should have only your first name(2), a nickname and display name(3) and a link to your own blog(5) in the URL area. This will make it easier for others to visit your blog if they are using the same blogging platform as you are. When leaving comments on other blogging platforms you might need to include your first name, a link to your blog and an email address as well as the anti-spam word. If leaving comments on kidblog, include your URL in the actual comment area as it does not normally ask for this otherwise. 3. Leave a comment on the blog of up to 10 students who have the same mentor as you. Make sure it is a quality comment – if the student has blogging or commenting guidelines, read them first. If your mentor has left a comment on your blog, perhaps visit their blog to ask some questions politely. Hopefully the mentor will have their name or avatar image linked to their blog URL. Always remember to check your spam comments as sometimes a real comment gets stuck in there. 1. Think about the athletes you saw at either the Olympics or paralympics. How do they look after their well-being? What are some things you do or eat, that they would not use? 2. How is citizenship on the internet the same as or different to citizenship in the real world? Make a list by comparing the two situations. Is citizenship different from country to country? What makes you a citizen of your country? 4. If you are ever in a very stressful situation, how do you calm yourself down? What are some coping strategies you use? 5. Create a collage about emotions. Have students create their own images or emoticons. Take photos of the results and create into a collage or animoto or slideshow. 6. What is your favourite sport? What skills are needed to become an elite athlete in that sport? 7. Indigenous groups will often have different games to other people. Compare games around the world that use very little equipment. Try out some of these games in your classroom. 8. 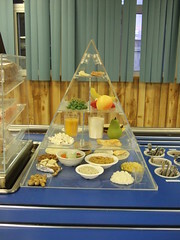 I am sure all students are taught about the healthy food pyramid. But what does your food pyramid look like? Create one using real food then take a photo to include in your post. 9. Part of good digital citizenship is not being a cyber bully. Have you ever been cyber-bullied? What did you do about it? Make a list of hints for students who are being cyber-bullied. Maybe make a poster about what to do and what not to do. Perhaps you could use glogster or as a class use wallwisher. 10 In Tasmania, the health department is running a program called ‘Move Well, Eat Well‘. Does your country or state run something similar? Are there any other programs your school takes part in that helps with student well being and health? 11 Pets are often said to be helpful with a person’s well-being. How? Find some examples. If none of these ideas make you want to write a post, then tell your readers what you are being taught at the moment that relates to health, well being and citizenship. Remember you are not only taught at school but also at home, at church, in a sport team and so on. Remember to add a link back to this post, once you have written your post. This is called a trackback or pingback and will then allow me to come to your blog easily to read your fantastic post. If using Edublogs, below your post dashboard, you will see an area called ‘Send trackbacks’. Just copy the URL of this challenge post and paste it in there. It must be the URL of the actual post, not the blog in general. Leave a comment below if you know of any great sites related to well-being, health and citizenship, especially if they have games included on these topics. « Ready … set …..
Pingback: Dawso's Blog » Blog Archive » A little about me! I’m CJ. I’m one of the students who participated in your Blogging Challenge. I have one question to ask you… how do you create a pingback? I have no idea how to make one and I decided to ask you. PS: Thanks for putting in my blog as a pingback! Whatever you did for challenge 2 was correct. Where you wrote about click here for Challenge 2, created a pingback for me to see your post on minecraft – lots of great explanations there. I might have to check out the game soon. Pingback: derek4gv » Challage 1: Canada’s Wonder Land!!!! Pingback: Who am I? | Ready, Set.... Read Me!!!! Pingback: Challenge 1 Wellbeing and introductions | Well Done! Hi, in computer lessons at school, we have been using this Australian government site about cyberbullying and cybersafety, called CyberQuoll. It has videos with a story and many different interactive activities. It may be fun to use!Here’s the link for you guys! Pingback: My Life as a Sixth Grade Teacher - Challenge #1: Well-being, Health, & Citizenship. We are using global2 blogs and we can’t find a spot to paste the link for the pingback. Do you have any suggestions to help? There’s a spot for tags and there’s a widget called ‘All in one SEO Pack’ whatever that means!There’s nothing about trackbacks though. I am checking with Edublogs as I write this reply. Will get back to you with the answer. OK, found out it relates to whichever theme you have. Some themes have the trackback underneath, others don’t. If it is not underneath then just add a hyperlink in your post back to the challenge blog. I did a post on my hero Lauren Jackson today who is an Olympian and inspiration. Does this count? My students have blogs for the first time and are very excited about taking part in the September 2012 Challenge.